Metallic green with bronze-colored wing covers. 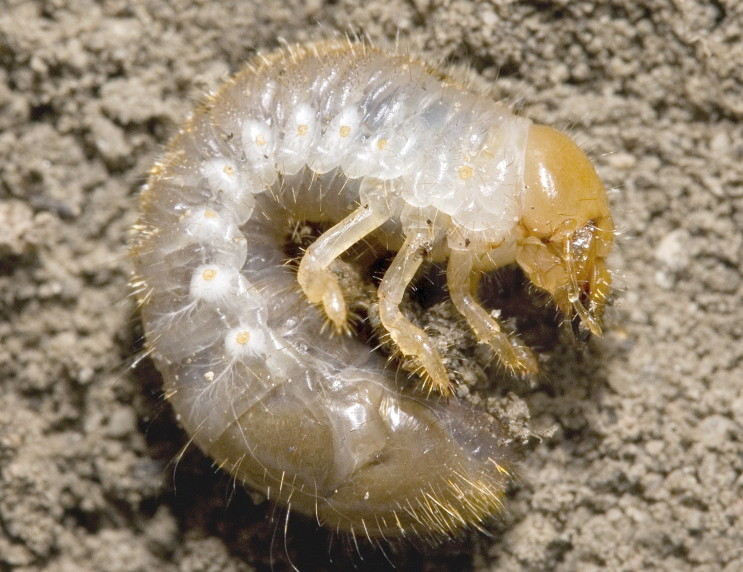 Larvae (grubs) live in soil and are rarely seen above ground. "C"-shaped larvae are creamy white with a brown head capsule. Immature larvae possess chewing mouthparts and three pairs of legs on the thorax. Maximum larvae length is about 1-inch. 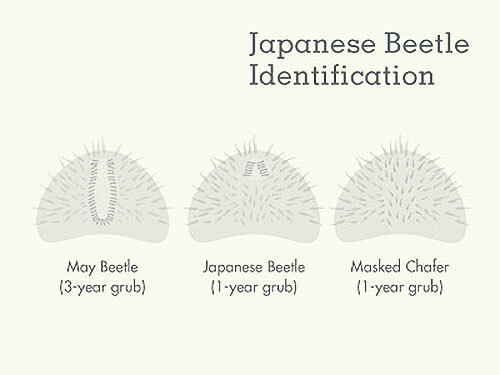 Similar appearance to other white grubs; look for the pattern of bristles on raster (hind end); Japanese beetle Larvae possess a V-shaped pattern of bristles. False Japanese beetles (above) are similar in size and appearance to Japanese beetles, but are not as shiny and as brightly colored. They also do not have the characteristic arrangement of six white tufts along their abdomen. 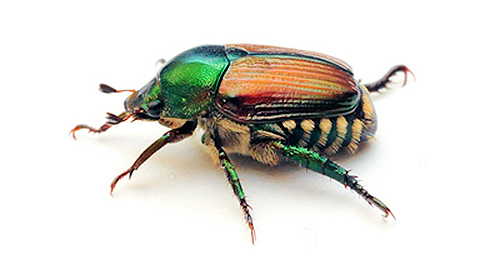 Japanese beetle is a relatively new pest in Missouri corn and soybean fields, so scouting procedures and thresholds may be modified with experience. Although Japanese beetle larvae will damage crop plant roots, thresholds for insecticide application are based on feeding damage by adults. Although leaf feeding is possible, threshold for insecticide application is based on number of beetles present. Observe 10 plants in at least five places in the field. Count beetles and calculate the number of beetles per ear. Determine the extent of silk clipping. 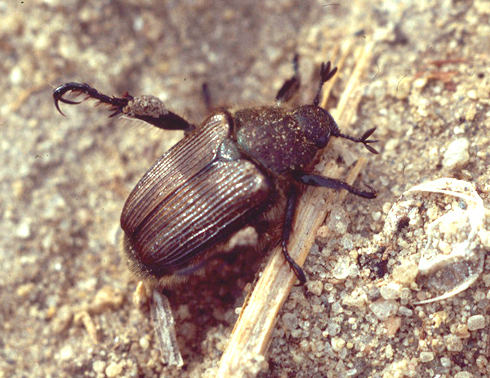 Threshold for insecticide application is three or more beetles per ear. Do not apply insecticide if pollination is more than 50% complete (brown silks). Threshold for insecticide application is based on percent defoliation, not number of beetles. Observe five plants in at least five places in the field. Larger fields may require additional locations. Estimate the amount of defoliation. Feeding often begins on leaves at the top of the canopy; do not focus solely on these leaves. Threshold for insecticide application is 30% defoliation before flowering (R1) and 20% defoliation between flowering and mid-pod-fill (R6).